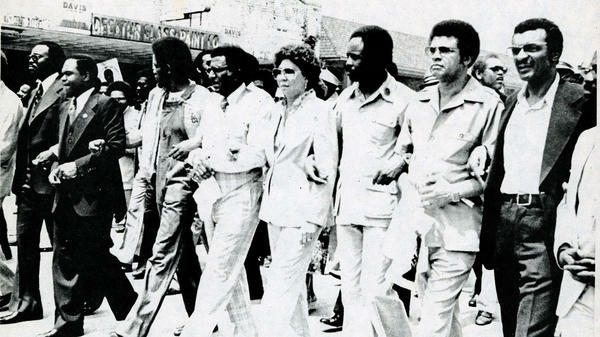 An undated photo from the exhibit shows Southern Christian Leadership Conference officials leading demonstrators in a march "against fear and injustice" in Decatur, Ga.
Resurrection City on the National Mall was an attempt by the Poor People's Campaign to bring attention to poverty in America. One person who shows up in several of the photographs in the exhibit is Dorothy Cotton, who was head of the SCLC's Citizens Education Program beginning in the 1960s. Cotton, now in her 70s, trained thousands of mostly Southern blacks on how to organize their communities, increase voter registration and stand up for their constitutional rights. Cotton is still passionate about the movement, and walking through the gallery at Emory's Woodruff library she recognizes early images of civil rights leaders and foot soldiers: Andrew Young, Joseph Lowery, James Orange, Rosa Parks and many unnamed faces who participated in SCLC campaigns. She says many don't understand what went on behind the demonstrations. "Of course, they couldn't really know about it because it was not something we could publicize," Cotton says. "We would have been shut down [for] teaching all those old black folk that they are citizens and that they have a right to vote and that they can deal with this ... American-style apartheid." A few audio clips of protests in the exhibit give just a taste of the audio contained in the library's collection. SCLC leaders planned demonstrations just after the first Selma to Montgomery march in 1965, after hundreds of peaceful protesters were brutally beaten by Alabama state troopers in what became known as Bloody Sunday. 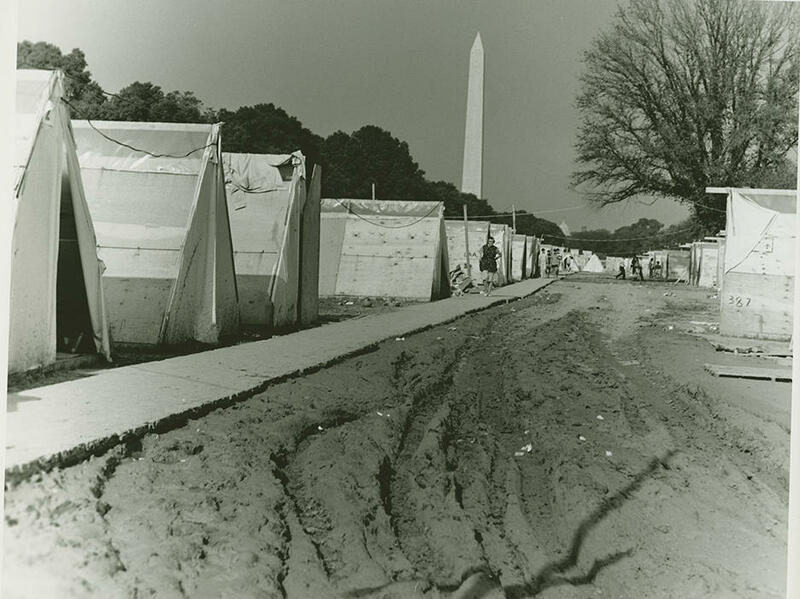 One section of the exhibit is devoted to the 1968 Poor People's Campaign in Washington, D.C. Thousands of people set up tents and shacks on the National Mall, in what came to be known as Resurrection City. The goal was to get the country focused on poverty in America. Without a clear victory, the encampment was dismantled, but civil rights leaders say it did highlight the work that needed to be done. Some even suggest it was a precursor to today's Occupy movement. The organization struggled to find its mission beyond the civil rights era, when inequality and racism were not so overt. The SCLC centered on human rights issues and campaigned to end apartheid, carried out economic boycotts, lobbied for health care reform and encouraged police departments to hold gun buy-back programs. "We really hope that the exhibition can be transformative," says Michael Hall, one of the exhibit's curators. "Tackling issues of poverty, psychological health, drug abuse; I mean you name it, they were really trying to protect the whole person. "So we're really hoping that it helps to guide people currently to think about how we can go about addressing some of these issues," he says. Cotton says these are people who changed this country and it is an important part of the nation's history. "It should not be forgotten that change is possible, as painful as it is to remember it," she says. "But change is possible." The SCLC is still going through changes, including a leadership struggle that split the group into two factions. Some suggest the organization has outlived its mission, but those who put this exhibit together say it documents how much is left to do. A new exhibit on the campus of Emory is bringing the university some more positive attention. The exhibit focuses on the history of the Southern Christian Leadership Conference. Curators have worked for more than three years to catalogue 1,000 boxes of historic documents that tell the story of the SCLC. NPR's Kathy Lohr met up with civil rights pioneer Dorothy Cotton as she took a first look at the exhibit. KATHY LOHR, BYLINE: Dorothy Cotton, now in her 70s, views photos in the Emory collection that feature her front and center. DOROTHY COTTON: My goodness, that's me again right in the middle there. I remember that dress and that headband. LOHR: In one black and white photo, Cotton is seated in a classroom. It's the '60s. The location is not known. Cotton was head of the SCLC's Citizens Education Program during the 1960s and early '70s. She trained thousands of mostly Southern African-Americans on how to organize their communities, increase voter registration and stand up for their constitutional rights. COTTON: I'm so glad you all found these photographs and it is history. Yeah, it is history. LOHR: Cotton is still passionate about the movement. As she walks though the gallery at Emory's Woodruff library using a cane, she recognizes early images of civil rights leaders and foot soldiers - Andrew Young, Joseph Lowery, James Orange, Rosa Parks and many unnamed faces who participated in SCLC campaigns. Cotton says many don't understand what went on behind the demonstrations. COTTON: Of course, they couldn't really know about it because it was not something we could publicize. We would have been shut down. And teaching all those old black folk that they are citizens and that they have a right to vote and that they can deal with this - I call it American-style apartheid. And so it was not something we could publicize. LOHR: Protests were part of the movement, and there are a few audio clips included, just a taste of the audio the library has in its collection. SCLC leaders planned demonstrations just after the first Selma to Montgomery march in 1965, after hundreds of peaceful protesters were brutally beaten by Alabama state troopers in what became known as Bloody Sunday. Here's C.T. Vivian, a close friend of Martin Luther King, Jr., speaking in Selma in 1965. C.T. VIVIAN: They want to protest that the fact the right to vote has so often been taken away in Alabama. They want to at last go to Mr. Wallace and to the seat of government to grieve their grievances and dream their dreams in a very practical and meaningful way. LOHR: A section of the exhibit is devoted to the 1968 Poor People's campaign in Washington, D.C. Thousands set up tents and shacks on the National Mall, known as Resurrection City, and it rained for days. The goal: to get the country focused on poverty in America. Without a clear victory, the encampment was dismantled but civil rights leaders say it did highlight the work that needed to be done. And some suggest it was a precursor to today's Occupy Movement. The organization struggled to find its mission beyond the civil rights era when inequality and racism were not so overt. The SCLC centered on human rights issues. It campaigned to end apartheid, carried out economic boycotts, lobbied for health care reform and encouraged police departments to hold gun buy-back programs. MICHAEL HALL: We really hope that the exhibition can be transformative. LOHR: Michael Hall is one of the exhibit's curators. HALL: Tackling issues of poverty, psychological health, drug abuse, I mean, you name it, they were really trying to protect the whole person. And so we're really hoping it helps to guide people currently to think about how we can go about addressing some of these issues. COTTON: This is an important part of our history. These are folk who changed this country. LOHR: Again, civil rights leader Dorothy Cotton. COTTON: It should not be forgotten that change is possible. As painful as it is to remember it, but change is possible. LOHR: The SCLC is still going through changes, including a leadership struggle which led to infighting and split the group into two factions. Some suggest the organization has outlived its mission, but those who put this exhibit together say it documents how much is left to do. Kathy Lohr, NPR News, Atlanta. Transcript provided by NPR, Copyright NPR.